Welcome to the latest post in our series of blogs exploring the family trees of the famous. Experienced family historian, Roy Stockdill, takes us on a journey through time as he investigates the family history of the famous, both living and dead. This time, Roy delves into TV presenter John Craven’s past. We’ve never met but I feel a kind of affinity with John Craven, the popular TV presenter. We’re both West Yorkshire lads, born very close in time to one another, and we both began our careers as junior reporters on local newspapers. John went on to become presenter of John Craven’s Newsround and later the BBC’s Countryfile. 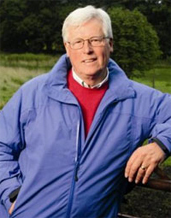 John Raymond Craven OBE was born on 16 August 1940 in Leeds. He is the son of Willie Craven and Marie Noble, who were married on 27 December 1937 at Kirkstall Congregational Chapel, Leeds. Willie, aged 27, was a grocer’s assistant and Marie, 25, was a printers’ envelope maker. 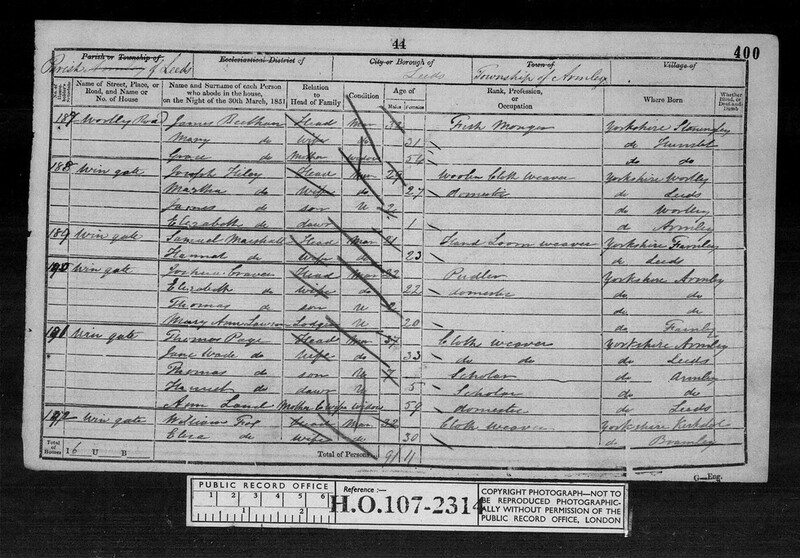 The marriage certificate shows Willie’s father as William Henry Craven, a blacksmith, and Marie’s father was Percy Noble, an assistant overlooker. 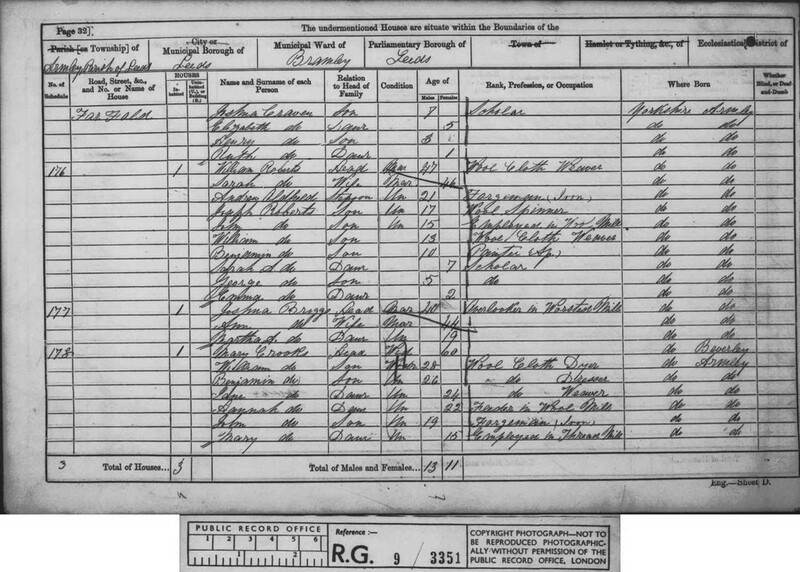 Willie Craven – he appears in the birth indexes as Willie, not William – was born in the registration district of Bramley, Leeds, on 29 November 1910 but his birth wasn’t registered until the following quarter, January-March 1911. I discovered the actual birth date from the index record of Willie’s death in 1990. Also in the household was Willie’s older sister, Mary, two, and a boarder, Charles Henry May, 28, an iron moulder and the brother of Sarah Ann Craven whose maiden name was May. The whole family gave their birth place as Leeds. One slight surprise was that, while all the children were shown as being born in Leeds, Eliza’s birth place was given as Stratford, London – the only one of John Craven’s direct paternal line ancestors I came across who was born outside Yorkshire. Researching John Craven’s paternal family tree farther back beyond his grandfather William Henry, the blacksmith, I discovered three successive generations of direct male ancestors who were all called Joshua Craven. For simplicity, I will refer to them as Joshua one, Joshua two and Joshua three but they will appear in this account in reverse order. Hopefully, all will become clear! 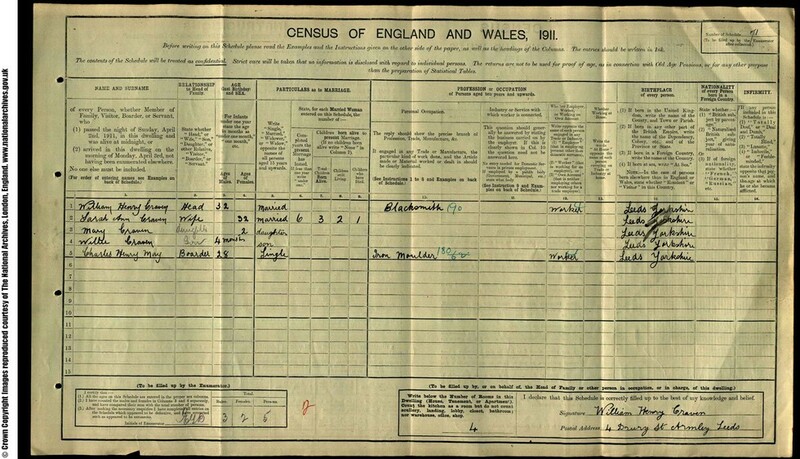 The father, Joshua three, was a forgeman (iron worker) of 38, born at Armley, and his wife Eliza was 36, born in London, just as she had appeared in the 1901 census. 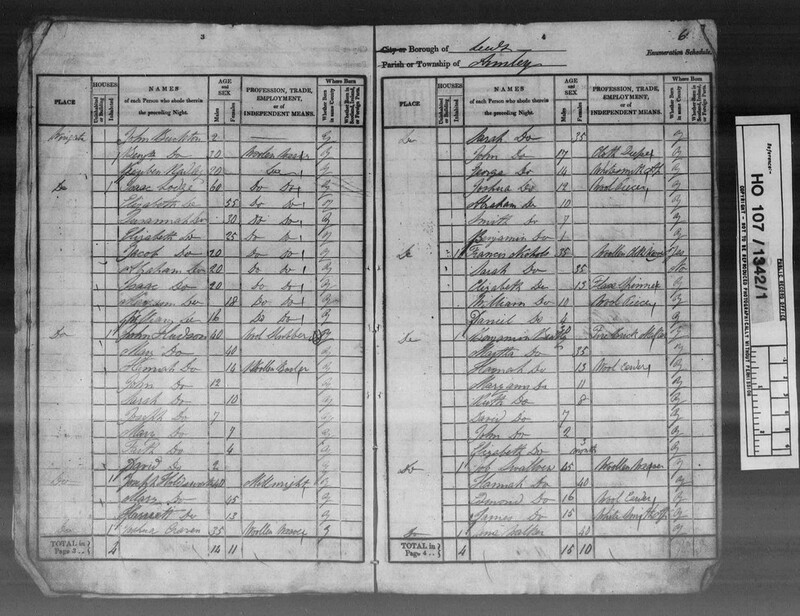 I found from the death indexes that Joshua died in the first quarter of 1900, which accounted for Eliza being a widow in the latter census. 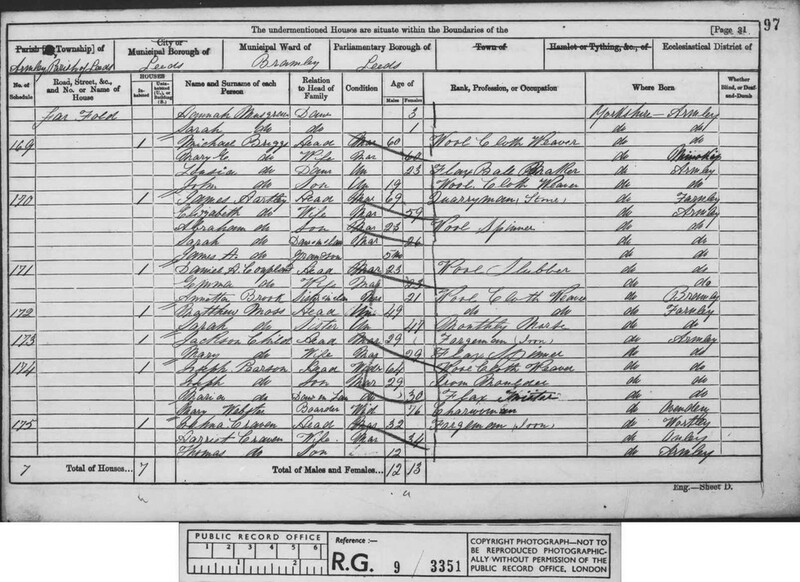 In the 1881 census Joshua’s name was abbreviated to Josh and the first name of his wife Eliza was enumerated as Elixer! Initially, I thought this must be a mis-transcription but a close examination of the schedule revealed that this was how the enumerator had written it. It’s worth noting here that you should never submit a correction to an enumerator’s entry if it has been correctly transcribed, even if you believe it to be wrong. 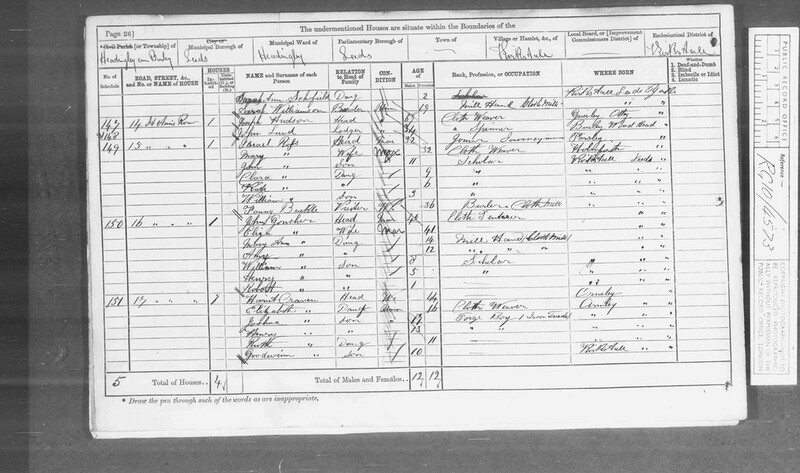 The golden rule of census transcribing is that you write exactly what you see and what the enumerator has put down. 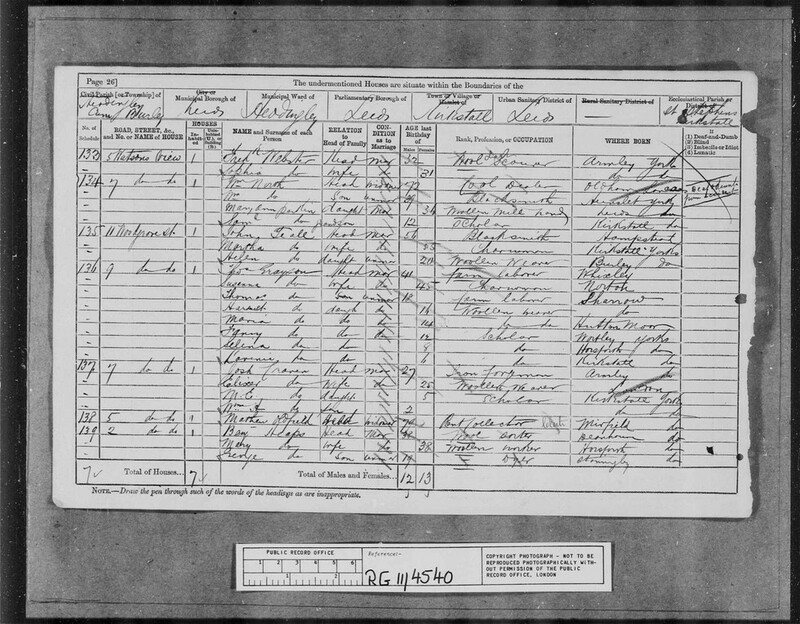 The birth of Joshua Craven (Joshua three) was registered in the Hunslet registration district of Leeds in 1854 and he married Eliza Slater at St Mathias’ Church, Burley, Leeds in 1875. These were the parents of William Henry, the blacksmith and the great-grandparents of John Craven. At birth Joshua was given the middle name of Standfield and when he married it was shown as Stanfield. This would later become important in tracing the Craven family tree back further. Joshua was then aged 17 and described as a forge boy in the iron trade. He had two sisters and two brothers, while the head of the household was Harriet Craven, aged 44 and born at Armley. Joshua Craven (Joshua two) was aged 32 and an iron forgeman – just as his son became – born at Wortley, near Armley. His wife Harriet was a couple of years older at 34 and this couple were John Craven’s great-great-grandparents. 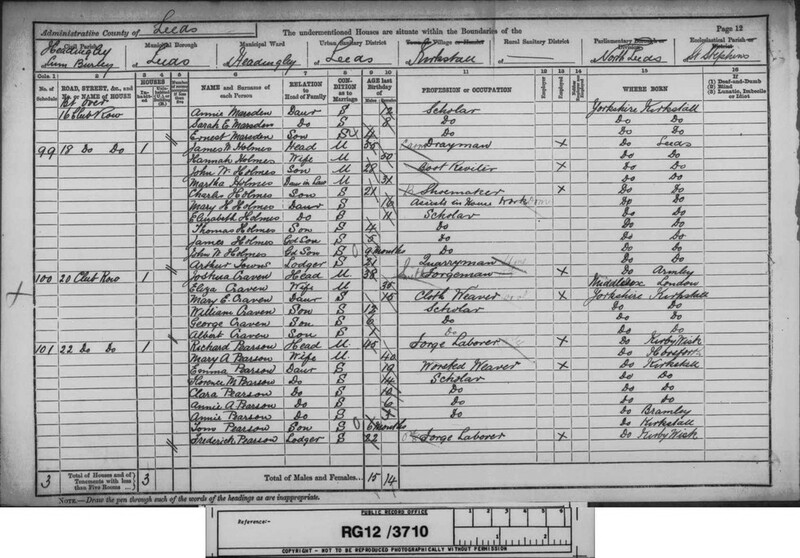 The 1861 census is particularly significant in the Craven family history because all three Joshua Cravens appear in it. I have already mentioned Joshua three and Joshua two, but also in the census of 1861 were Joshua Craven one and his wife, Sarah. Joshua one was born in around 1803 at Pudsey, an industrial town midway between Leeds and Bradford, while his wife Sarah, also 58, was born at Wortley, Leeds. First I found the death of Joshua Standfield Craven in 1864 at Bramley registration district. This was Joshua two, born in about 1829, so he was only in his mid-30s when he died. This explained why Harriet Craven was a widow in 1871. Searching the 1851 census, I came across something which initially threw me and made me wonder whether I had the right man. Joshua two was there; however, his wife’s name was given as Elizabeth and not Harriet! 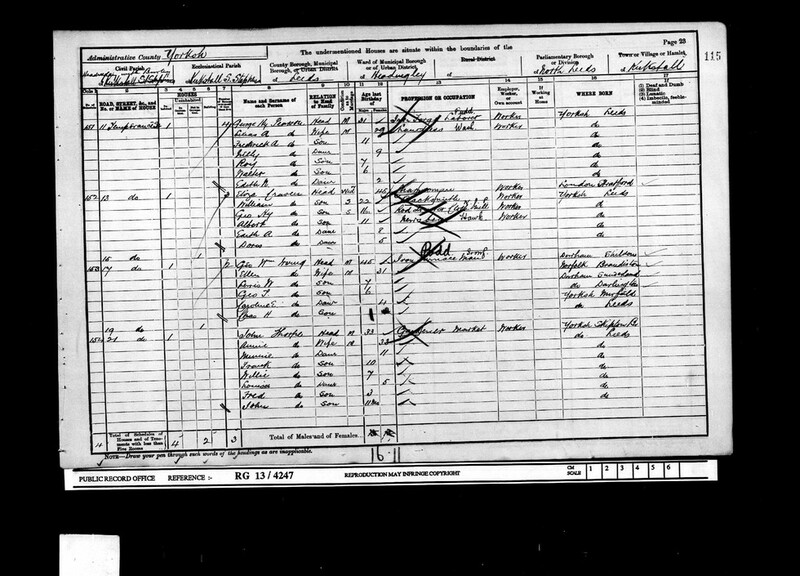 Everything else seemed to fit: Joshua’s age was given as 22, his birth year 1829, his occupation as a pudler (another iron trade job) and his birth place as Armley. After research in the General Register Office marriage indexes and the marriage indexes at Yorkshire register office, I established that a Joshua Craven married Elizabeth Nichols at the parish church of St Peter’s, Leeds, in the second quarter of 1849. 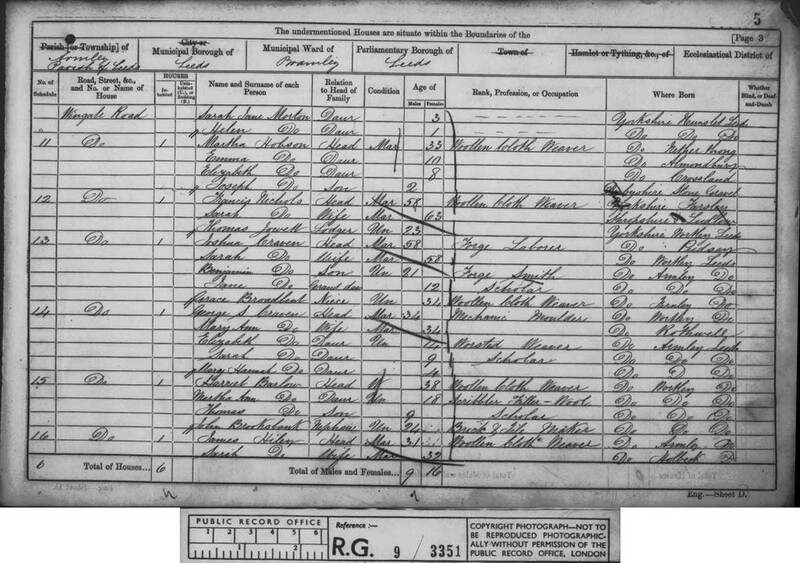 A search of the death indexes produced a number of Elizabeth Cravens who died in the Leeds area between 1851 and 1854, one of whom was the wife of Joshua two. The most likely candidate was an Elizabeth who died in the April-June quarter of 1851, for in the first quarter of 1852, Joshua Craven married Harriet Atha at St Philip’s Church, Leeds. So the mystery was solved! Poor Elizabeth died young at only 22 and Joshua remarried a few months later to Harriet and had more children with her. Joshua one’s birth year was shown as 1803, his wife Sarah Craven’s was the same and there were three sons whose ages ranged from 11 to 19, the whole family being shown as born at Armley. A nephew and niece were also in the household. Now to the final piece of the puzzle which enabled me to get the family tree of John Craven back yet one more generation. Joshua one died in 1878, aged 75, so he outlived his son, Joshua two, by some 14 years. I mentioned that Joshua two was described at death as Joshua Standfield Craven and his son (Joshua three) was registered at birth also as Joshua Standfield Craven. I discovered that a Joshua Stansfield [sic] Craven was baptised at Wortley by Leeds on 11 April 1830, son of Joshua and Sarah. The likelihood is fairly high that this was Joshua two. I was unable to identify for certain the maiden name of Joshua’s mother, Sarah, for there were several possible marriages in the Leeds area for a Joshua Craven to a Sarah between 1818 and 1823. I believe, however, that I found the baptism of Joshua one at Pudsey on 29 August 1802, the father being shown as Abraham Craven. Pudsey was given as Joshua’s birth place in the 1861 census. Pudsey had a Chapel of Ease to the then larger parish of Calverley. The online registers revealed the extra information that Joshua one’s mother was called Elisabeth. I then found the marriage of Abraham Craven, a clothier, to Elisabeth Stansfield at Calverley on 8 December 1793. 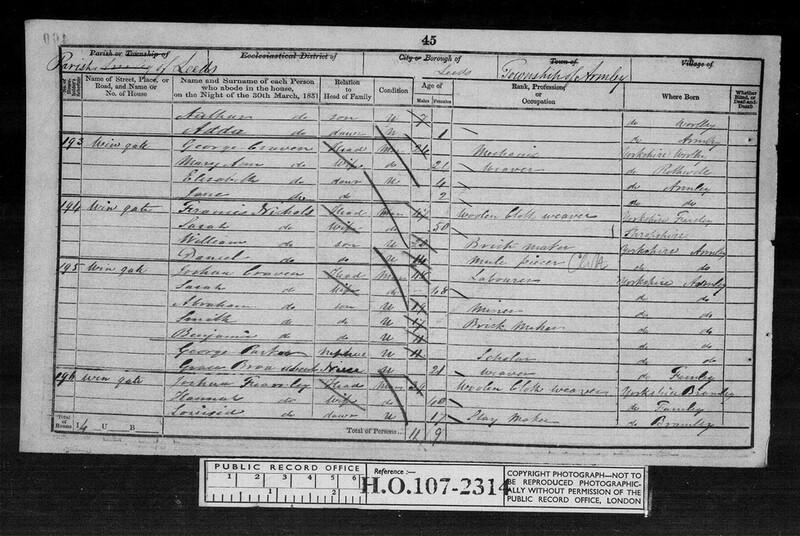 So it looks as if Joshua Stansfield Craven (Joshua two) was given his grandmother’s maiden name as a middle name and he then passed it on to his own son, Joshua three. If my speculation is correct, then Abraham Craven and Elisabeth Stansfield were the great-great-great-great grandparents of John Craven. The last name Craven appears in the registers of Calverley many times, going back to as early as a baptism of Robert Craven in 1585 in the time of Elizabeth I, with the earliest marriage being that of another Robert Craven to Sybil Baytson in 1596. Maybe these were much earlier ancestors of John Craven, but it would take considerably more research (and substantially more space than I have here) to get the pedigree that far back. Roy Stockdill has been a family historian for almost 40 years. A former national newspaper journalist, he edited the Journal of One-Name Studies (for the Guild of One-Name Studies) for 10 years. He is on the Board of Trustees of the Society of Genealogists and is commissioning editor of the ‘My Ancestors…’ series of books. He writes regularly for Family Tree magazine.